The publication that is being made available to you on this website is for your personal use only. You may not reproduce the publication in any manner whatsoever, nor use it for any commercial purpose without the prior written consent of RPI Publishing, Inc., the holder of the copyright. Copyright © 1992 RPI Publishing, Inc. All rights reserved. No part of this book may be reproduced or transmitted in any form or by any means, electronic or mechanical, including photocopying, recording, or any information storage and retrieval system, without written permission from the copyright owner, except for brief quotations embodied in reviews. All the scripture quotations are from the New International Version of the Bible. 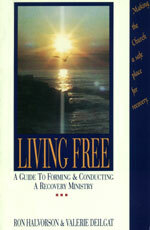 The Twelve Steps have been reprinted and adapted with permission from Alcoholics Anonymous World Services, Inc. For purposes of this book, the word "alcohol" in Step One has been changed to read "the effect of our separation from God," and the word "alcoholics" in Step Twelve has been changed to read "others."